Hendo Wounded Warrior Bridge is BACK! The last two Sunday rides have been postponed for some seriously necessary TLC at Henderson Pond. The Wounded Warrior bridge was on its last leg and was in dire need of repair. Last Sunday, the crew was out demolishing the existing structure. We were able to save almost every decking board and a bunch of nails and the bridge was in a neat pile or three ready for phase two; the rebuild. The new stringers and footers were purchased and transported early this morning with a bunch of new and old faces to lend a hand. Alex and Jeff were juggling their chainsaws while the young strong backs were doing some heavy lifting to get the footers and stringers in place. Hammers were in full chorus and all of the deck boards were re-used with none to spare. To celebrate a job well done, frothy beverages were had as we all took a step back and admired all of the hard work. 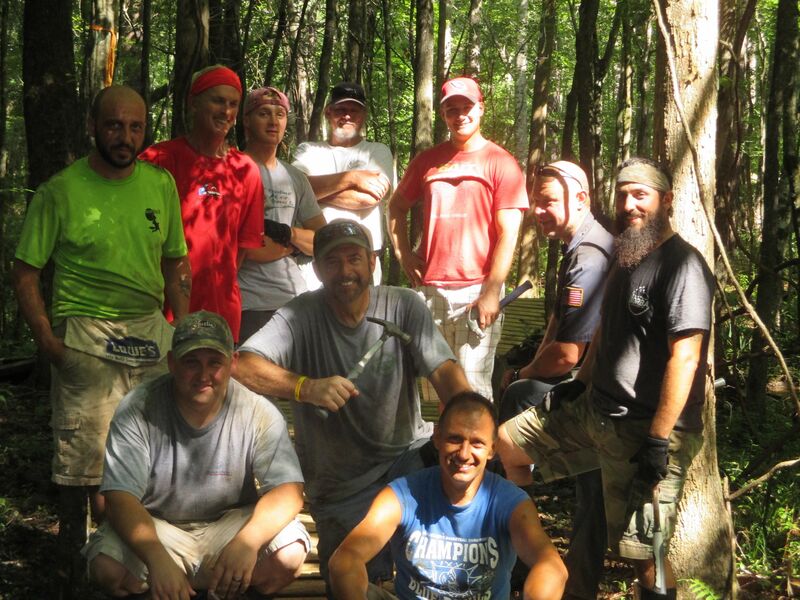 We are proud and lucky to have such amazing club members who give their time and effort to give back to their trails. Thanks to the amazing work, DEC Trail Crew! Now get out there and ride it! Check us out on MEETUP for our next MTB group ride and trail maintenance day.